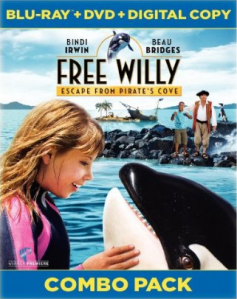 This Tuesday (April 20th), Warner Home Video released the direct-to-DVD sequel Free Willy 4: Escape From Pirate’s Cove, for the week of Earth Day. The film’s young star, Bindi Irwin, was at the Toronto Zoo last month for a screening of the film for a school group, and you can read about that event (which included a brief Q & A) here. It’s clearly following basically the same storyline as the first three Free Willy movies, when her grandfather wants to sell the whale to another amusement park owner for money, and Kirra goes on a quest to return Willy to the ocean. The difference is this time it’s taking place in South Africa with new characters. For those of us who remember the first three, this won’t stand up the same way, without any of the same suspense felt in those ones, but to newcomers to the franchise, it’s a fine place to start. Free Willy 4: Escape From Pirate’s Cove is 101 minutes, and is rated PG.